Viral infections of the CNS in the tropics and Indian subcontinent are not only different from that encountered in the western world, but many types are constantly emerging. While age-old scourges like polio have recently been contained in these geographical areas to a great extent, thanks to effective vaccination programs, others like Japanese encephalitis, rabies, and measles in the form of subacute sclerosing panencephalitis have been inadequately controlled. In recent times some viruses causing predominant CNS symptoms such as West Nile, Chandipura, and Nipah have emerged. Emerging viruses also include others that may occasionally cause CNS symptoms such as enterovirus, dengue, and chikungunya. The CNS manifestations of most of these viruses may be in the form of aseptic meningitis, encephalitis, or myelitis either in isolated form or in combination. Many of these viruses such as Japanese encephalitis cause large-scale epidemics with high mortality and morbidity. This chapter discusses the current status of many of these viral infections of the CNS predominant in these geographical areas. Joshi R, Mishra PK, Joshi D, et al. Clinical presentation, etiology, and survival in adult acute encephalitis syndrome in rural Central India. Clin Neurol Neurosurg. 2013. doi:http://dx.doi.org/10.1016/j.clineuro.2013.04.008. NVBDC P. Directorate General of Health Services. Ministry of Health and Family Welfare. New Delhi. 2010. Available from http://nvbdcp.gov.in/je-cd.html. World Health Organisation. West Nile Virus. Media centre. Fact sheet, July 2011. [Internet] 2013 [cited 2013 June 19]. Available from http://www.who.int/mediacentre/factsheets/fs354/en/#. World Health Organisation. Media centre. Poliomyelitis. Available at. http://www.who.int/mediacentre/factsheets/fs114/en/. Accessed 5 July 2013. Lewthwaite P, Perera D, Ooi MH, Last A, Kumar R, Desai A, et al. Enterovirus 75 encephalitis in children, southern India. Emerg Infect Dis [serial on the Internet]. 2010 Nov [date cited]. http://www.cdc.gov/EID/content/16/11/1780.htm. doi: 10.3201/eid1611.100672. WHO Factsheet. Rabies. Available at http://www.who.int/mediacentre/factsheets/fs099/en/. Accessed 3 Nov 2013. World Health Organization. Rabies. Guide for post exposure prophylaxis. Available at http://www.who.int/rabies/human/postexp/en/#. Accessed 3 Nov 2013.
WHO guide for rabies pre and post-exposure prophylaxis in humans (revised 15 June 2010). Available at http://www.who.int/rabies/PEP_prophylaxis_guidelines_June10.pdf. Accessed 3 Nov 2013.
WHO: Measles deaths decline, but elimination progress stalls in some regions. Available at http://www.who.int/mediacentre/news/notes/2013/measles_20130117/en/. Accessed 3 Nov 2013. Fernandez-Muñoz R, Carabaña J, Caballero M, Ortego J, et al. Subacute sclerosing panencephalitis and other lethal encephalitis caused by measles virus infection: pathogenesis and new approaches to treatment, non-flavivirus encephalitis. Dr. Sergey Tkachev, editor. InTech; 2011. ISBN 978-953-307-720-8. 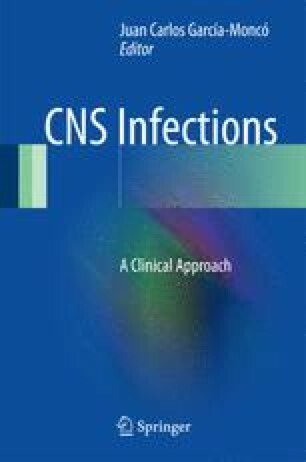 Available from http://www.intechopen.com/books/non-flavivirus-encephalitis/subacutesclerosing-panencephalitis-and-other-lethal-encephalitis-caused-by-measles-virus-infection. Accessed 5 Aug 2013. Chandipura encephalitis. Available at http://icmr.nic.in/pinstitute/niv/CHANDIPURA%20ENC.pdf. Accessed 3 Nov 2013.